ATN NVBNB08X3A NVB8x-3A Night Vision Binocular FREE SHIPPING! 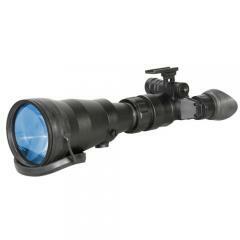 The ATN NVB8x-3A is an extremely powerful night vision binocular that offers 8x magnification, perfect for long distance observation in low-light conditions. At its core is a high-resolution, third-generation intensifier tube, complete with automatic brightness control and bright light cut-off functions to adapt to and protect it from changing light levels. The multi-coated, all-glass optics offer excellent light transmission for superior clarity and contrast, allowing operatives to spot details even at extreme ranges. The binoculars also include a detachable, infrared illuminator to provide visibility even in zero-light conditions. Their weather and fog resistant design ensures they are suitable for use in all weather conditions, guaranteeing ultimate versatility. Canadian Badge - B702 - 2 1/4" x 3 1/4"
©2002-2019 CopsPlus.com: ATN NVBNB08X3A NVB8x-3A Night Vision Binocular FREE SHIPPING!